For November, here’s piece from a composer with a November birthday: Scott Joplin (born November 24, 1868). 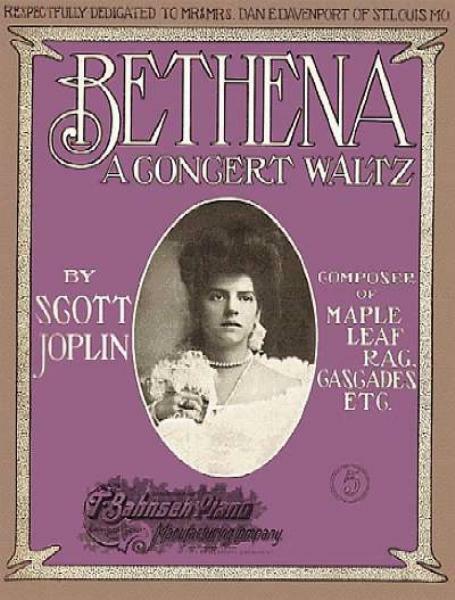 “Bethena: A Concert Waltz” was the first piece he composed after the death of his young wife, Freddie Alexander. Just twenty years old, she died only ten weeks after their marriage from a cold that turned into pneumonia. Reportedly, the image on the original sheet music (shown at right) is her wedding photo. Below is an excerpt of the main theme. The rhythm occurs, in several melodic variations, throughout the piece. Clearly, there’s a characteristic schism between the rhythms in the melody and the waltz bass. This is the “ragged” quality that gave “ragtime” its name. We might think of it as syncopation, or as a polymetric juxtaposition. Imagine that same melody, notated the same way, but transformed to 6/8. In this case, we’d sense the rhythm as iambic (short-long), with a lilting quality. Play it; move it; get a sense of it. That’s quite a difference, isn’t it? In 6/8, the bass and melody are completely congruous; there’s no push or pull. It truly takes the “rag” out of the rag. There’s a sense of “emphasis,” if you will, on the eighth notes, because they mark the crusis of each compound beat. That special lift comes from the character of compound meter. For the advanced: combine the two meters into a polymetric exercise. Experienced eurhythmicians can get the sense of it by conducting the 6/8 feeling of the melody with the right arm (vocally articulating the iambic rhythmic pattern), while simultaneously conducting 3/4 with the left arm. You might try stepping the bass in 3, and swinging the arms in compound two, clapping the iambic pattern. For whatever reason, we’re more likely to sense the result of this (“2 against 3”) from the perspective of 3/4 meter, not 6/8. What you’ll probably notice is a certain energy interrupting the flow of 3/4, coming from the interjected (second) compound beat. In the polymetric sense, that energy is a lifting sensation, since the characteristic of the compound beat itself (swinging, conducting) involves a crusic lift, and that’s further emphasized when it’s juxtaposed with the linear quality of 3/4. Another, more accessible way of perceiving (and thus performing) the piece is to sense the melody’s rhythm as syncopated. The difference is subtle to the listener, but it’s a very different physical/musical experience for the performer. Syncopation is easier to sense than the polymetric approach, which requires holding onto two very different meters simultaneously. A special emphasis still occurs on the second half of the second beat. So why are my arrows pointing to the first half of that beat — the tied note? That’s the key. That’s where the energy is a pull or a resistance, a holding back, perhaps a certain sense of pressure or arrested momentum. And that’s what gives the next eighth note its own special momentum forward, as a release of that same energy. It’s what Jack Stevenson expresses as the “unh!” As I see his interpretation, the opposite shoulder to the free leg says “let’s go!” to the rest of the body, moving forward and pulling the rest of the body to the next step. In Latin dancing, it’s a moment when the ribs pull the hips toward the next step. In any case, it’s a very active, alive moment of willful suspension (as opposed to the free suspension of a circular swing). It’s the key to the physical reality of the rhythm. If Variation 3 seems more natural and closer to the original, you’d perceive the syncopation as delayed. (The second beat is “late.”) Your sense of “accent” or energy will be heard on the second half of the second beat (the second eighth note, in Joplin’s original notation) as a release of sustained energy. If Variation 4 seems more natural and closer to the original, you’d perceive the syncopation as anticipated. (The second beat is “early.”) Your sense of “accent” or energy will be heard on the second half of the first beat (in Joplin’s original notation, on the first quarter note) due to sudden forward momentum. The next eighth note is felt as a resolution; a sigh of relief. Getting back to that “key,” indicated by the arrows in Variation 2. How is it best taught? In the philosophy of Jaques-Dalcroze, it’s taught through aural experience, physical experience, and a teacher who can lead students to discover, identify, and draw from the physical/musical realities of those experiences. Classic Dalcrozian exercises include the “horse and buggy,” where one partner literally pulls the other. For delayed syncopation, the pulling person — the “horse” — might step beats while the “buggy” steps a rhythm having one or more beats “late,” thus both feel a natural resistance, pull, and release of energy from two sides of the equation. In the case of Bethena, the “horse” should step the rhythm of Variation 3, with the “buggy” stepping the Joplin’s rhythm (notated in different fashion in Variation 2). And finally, if you play or teach Bethena, don’t miss the broader sense of it. Think of who and where it came from; give it full cultural and historical perspective; consider the life of Scott Joplin, and the particular moment in his life when he wrote this piece. Overall, it has a poignant simplicity to it; a reflective quality. It’s not a piece invoking a march or a cakewalk; the waltz, especially at that time, was considered a very intimate dance. (Only a few years before, it was shunned as downright scandalous!). The subtitle “concert waltz” suggests a loftier tone toward that intimacy, placing on a stage something for others to view only at a distance. Freddie Alexander wasn’t his first wife, nor his last. But the sudden death of this beautiful young bride, only weeks after their marriage, was by all accounts heartbreaking for Scott Joplin. In that fuller sense of the piece, the syncopations are less “ragged” and more undulating, the way sobs are — catching a breath, and finding the sigh that releases it; moving ahead in a limping way; seeing life go on apace (the 3/4 bass) while being caught up in something else — tender, lilting, introspective. Knowing what he needed to do to continue to sell music, Joplin carried on. But underneath Bethena, there’s a sense of a separate dance above the waltz, a private moment beyond the typical ragtime craze, a beautiful restraint in the melodic fragment spoken on just three pitches. It’s a different sort of piece. As a waltz, it’s a different sort of waltz; as a rag, it’s certainly a different sort of rag. This genre of music has long been cast as simple, happy and carefree (and sometimes, as a lesser, primitive predecessor to jazz). In Joplin’s own time and long before it, it was likewise widely assumed that all African Americans were “simple, happy, and carefree.” Thus all of their work was seen through that same lens. Such characterizations fall short of recognizing the the full lives of these composers, and thus the full backdrop of their music. Scott Joplin’s grave is at St. Michael’s Cemetery in East Elmhurst, NY. His epitaph reads simply: American Composer. Bethena is a wonderful example of American history, heritage, and humanity, and a lovely example of American music — from the heart of an American Composer.